CAPOON’S BAY, Tortola, VI – At Large Representative and Junior Minister for Tourism, Hon Archibald C. Christian has urged that the territory implements a policy mandating that special holidays such as that for H. Lavity Stoutt be set aside for celebrations and activities surrounding the significance of the day only. 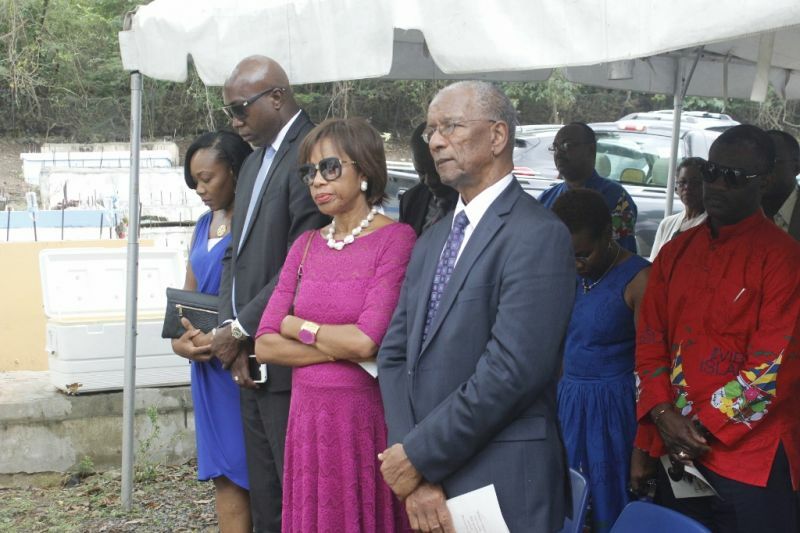 He was speaking during the annual grave site commemorative ceremony for the late former Chief Minister held at Capoon's Bay on Monday March 7, 2016. 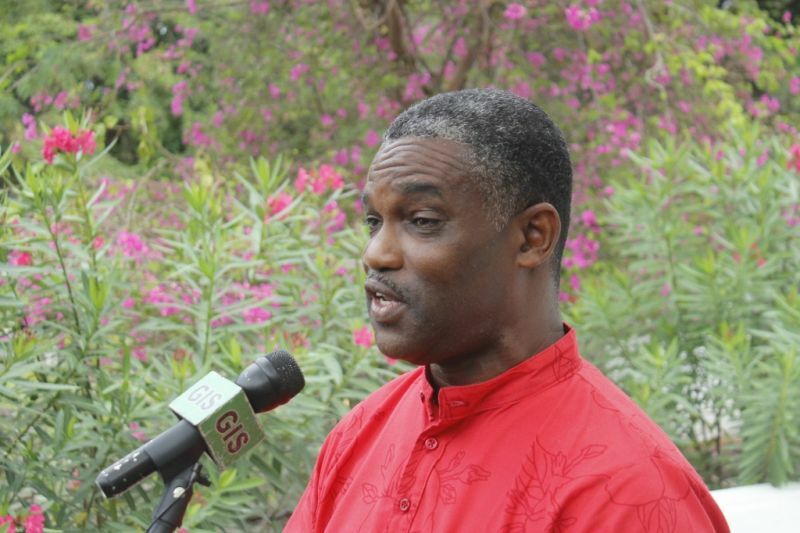 Christian, known for his strong criticism of expatriates living in the Virgin Islands, said he came across literature from another overseas territory which wanted to set aside special holidays for activities related to the holiday only. “I was sharing a story with some people this morning. It was an extract from the Turks and Caicos Islands where a former Chief Minister /Premier was suggesting that on national holidays immigrants from other countries should not be celebrating any event apart from that which is taking place in the country that day,” he said to loud applause. Christian, now Junior Minister for Tourism, said he endorses such a policy and would like to see it adopted in the territory. “If I may be bold I would like to go on record and say that I endorse that sort of thing. This is a national holiday to celebrate H.L. Stoutt and if anybody wants to do any celebration today it should be done around this giant, this leader of our country,” he said. Further, he expressed the hope that the grave site of H. Lavity Stoutt be included in the territory’s historical sites, where tourists can be able to see and experience the history of the territory’s first Chief Minister. “Tourists stop at Bombashack... it’s an iconic location. History lies behind these great walls. Behind these great walls lie a giant and someone we need to present to the world,” he said. In the past Honourable Christian had called for immigrants to stop bringing their alleged dirty habits to the VI regarding garbage disposal. Irresponsible position to take. It cannot be monkey see monkey do. why this man have this disdain for expat people? he although born here cannot trace his family roots on either side of his family any where in the VI. Same for Mark, Myron, and probably the speaker of house, but hen again das another topic. Seize the time. Implement what policy? Why you all don't leave people alone and stop trying to suppress the population. Talking about extract from Turks and Caicos..monkey see monkey do huh? Come on, are we losing it here or what? Are we to start worshiping IDOLS? Do not let your over zealous behavior turn you into a monster. The grave is there and no one is going to remove it, unless you have another plan to bring it to town so that the tourists would not have to travel too far to visit it. Pathetic! People gave their lives for the freedom he would like to take away. Y this man don't stop talking sh*t. I mean he could talk about so many things but always blasting the immigrants. He need to stop. Is the same immigrants that help with the development of the BVI. Tell me how many BVIslanders that were at the celebration. You give people a holiday does it matter what the hell they do with it. Come on who know if H.L Stoutt was not discussed at the homes. JTV had an awesome show about HL Stoutt. Who know if that wasn't watched to get educated more about the great man. Come on stop being so racial and bias. You are just showing your true colors. As Myron say not only book sense you need to be a minister you also need common sense. Think before you speak. So would that dictate cover Virgin Islanders and Belongers who do other things on that day, or only "immigrants"? There are people who don't observe Christmas or Good Friday or Ramadan or the Feast of the Bab or Diwali etc. etc. -- that is freedom of choice, but they should not be free to do anything not related to Lavity Stoutt on the anniversary of his birth? Mr. Christian, I like you, but this is nonsense -- we don't live in a dictatorship! Is Archie talking nonsense or he is in artfully making the case for celebrating HL Stoutt holiday. The BVI is a capitalist and democratic society. As such and like is the practice in some other countries( do not care what they do in TCI) , government should not be forcing anyone to celebrate anyone or an event. To pass legislation forbidding immigrants from celebrating events not related to a specficied holiday is rediculous. Will there be a penalty for locals holding celebrations not related to a holiday? Instead of lighting a fire under (force)people to get them to celebrate a holiday, we should light a fire within( motivate) people to do so. Agree that visitors and immigrants should respect the customs, courtesies and culture of the Virgin Islands. However, we should create the environment for them to voluntarily and naturally do so. Celebrating customs, courtesies and culture is something that should be done all year round, not one day a year. Celebrating all year will make it come as natural as breathing and all residents and visitors would buy into it. Wassup with Archie and expats? Archie is a subtract of expats (Antiguan parents) so one would expect that he would show some partially towards expats. Election is coming in 2019 so I suspect that a certain segment of the electorate will have much to say. As King Obstinate says " Wet your hand and wait for me." Our late visionary leader, The Honourable Hamilton Lavity Stoutt, famous adage was- “Where there is no vision the people perish.” Now we are truly witnessing the essence of those words up front and political. We are certainly getting what we voted for, and the experience continues. Good job HLS was born the same day as me and not December 25th!! I don't celebrate birthdays!! Who made him a Junior Minister? Everything does not boil down to bullying. Some a unnu love support corruption too much! I am auditing all the recommendations which are being put forward by our representatives and I cannot but wonder if this isn't how our economy got into the mess it is in. Foolish decisions in and ignorance out. Is this the best our representatives can do? Give me a break!! Those island people (including Archie) should celebrate Mr Stoutt everyday for making the BVI and their lives better. lets be clear they celebrate Allah!! not the birth of Christ. through the Koran originated from the Christian bible!! Titles, Positions, and Power have now really turned some of our “default leaders” mad in the Virgin Islands. It begs to remember the old adage that says, "In the land of the blind, the one eye man becomes King." We cannot continue to act blind as to what is now being allowed to develop in our country. Taking away certain liberties from the People only embolden more dictatorial behaviours. I would say, it should be greatly recommended, and not mandate. Hon. Christian, humbly speaking, tone it down. Remember there are a lot of Belongers/BVIlanders who just like you may have a parents who were once an expat, or who themselves who were once an expat. Lets face it, the BVI 50 years ago is no longer the same BVI (when its comes to great grandparents, grand parents, parents, children) all from the BVI, most are mixed somehow, so TONE IT DOWN. I think you can make great points/ideas without seeming like you are somehow attacking the expats. I am an "immigrant" so was my father who lived here. 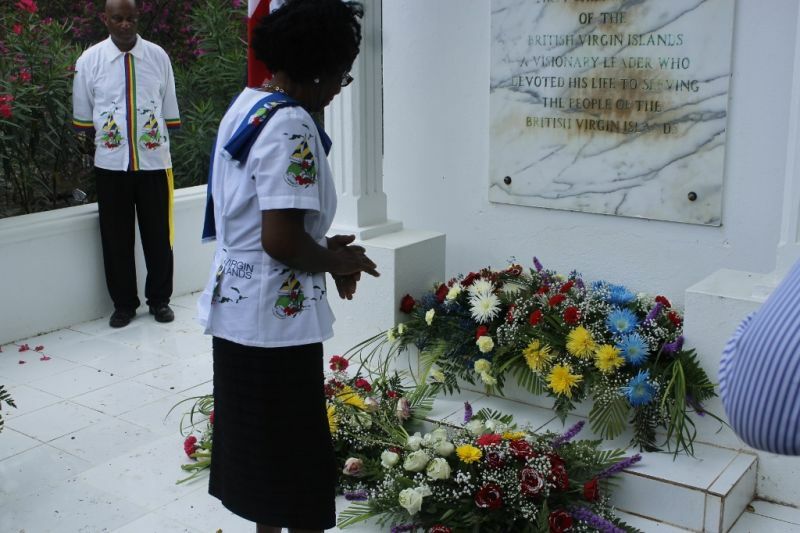 He had nothing but praise for the late Chief Minister Lavity Stoutt. Later in my life I met Mr Stoutt through official functions. In my opinion he respected people...immigrants anyone. He helped many who were not "from here" yet his undying love for his own people was not compromised that is one of the reasons he was a great man who should be remebered. Hon. Christian this holiday should be celebrated freely by people who loved and respect this great man but it should not be done on the borders of despotism after all Mr Stoutt was not a dictator. Hon. Christian are you for real? expats are our brothers and sisters. people who help build this territory. I am a born B.V.Islander , my parents , Grandparents , great grandparents are from here. You are wrong to be talking like this. You Sir should be ashamed of yourself. I also know you personally and I think you should publicly apologize to the people of this territory. We always trying to pattern from other countries. let us do what is right and lets be a shining example for these other countries . come-on man! Imagine we going independent under the likes of Archie Christian and Myron Walwyn...Not on your LIFE I will rather do a suicide bombing of myself!!! Sir with all do respect for you and your position but we are living in a democratic society under the grace of God freedom to choose , but this sound like the king in the bible with daniel and the idol been set up by the king for people to worship on that day when the bell rong witch david disobeyed and do what he accustom to do pray and not bowing down to worship some dump idol and was thrown into the lion den woow well i guest he will have to go look for them pick them up and have them thrown into the den..
"At Large Representative and Junior Minister for Tourism, Hon Archibald C. Christian has urged that the territory implements a policy mandating that special holidays such as that for H. Lavity Stoutt be set aside for celebrations and activities surrounding the significance of the day only." @read this - Read the article in its entirety. The responses are justified! Notice the First Lady in the picture? Did she want to be there? He said in other caribbean islands where national heros honored on that particular day, no other event is planned or observed. Hon. Christian coem visit your ancestral home in ......Antigua. You will learn to appreciate other people. Are you ashame of your roots or are you just trying to fit in? You are the son of an immigrant oyu cant change that. What is your point, he should not love and look out for the best interest of the territory he was born in because his parent weren't from that territory? The BVI actually has it's own Donald Trump ! Archie, don't be an @$$. Archie done lose his damn mind I swear!! Look what our government & country on a whole reduced to, now we want laws in place to force ppl to celebrate certain holidays, TF really going on in this place SMGDH. So because we see other countries doing something mean we must follow fashion without analyzing if it really make any sense? Maybe what The TCI proposing works for them but that don't mean it will for us here. Archie how bout tackling REAL & SERIOUS issues that plaguing this country like when is minimum wage being raised, ridiculous cost of living, affordable housing for ppl, being able to purchase a piece of land or home, proper health care, proper education, water woes, electricity woes, CORRUPTION. Man look, if you gone in government just to say you in government & have no current or prospective ideas and/or solutions to help out this country resign your post, you & the rest of the posse. One Garrut trying to kill the locals and the other Garrut trying to kill the island people them. There's no way that this should be limited to the BVI. It should be a cast-iron law requiring all people within the BVI and all BVI Islanders anywhere in the world to do nothing but pray to Mr Stoutt on such day. Mr Christian as am immigrant I have always respected you. Politics have done something to you. You were better when you were just "Archie"
Locals not doing it only, why should immigrants? You really take islaand people for fools, don't you, Archie? My entire family and I will never forget not to vote for this man again, never, never, never, neveeeeeeeeeeeeeer. There was a man that wanted to take five sacs of ice from an expat ice box and pay for three. Archie stop talking PISS. I am from right here and do not agree with this foolish idea. Slavery is over. Why you seemingly demand what someone does with their public holiday? Meshon you crazy or wha? Locals and expatriates alike have a right to do what ever they feel to do on any damm holiday in the year. Don't get too cocky now young man!!!!! I get what Christian is saying, I recalled a Territory Day when anther Caribbean national group has a big event in promotion of their country's heritage. Also Cultural Day in November is not International Culture Day, it is Virgin Islands Culture Day. It's very interesting that he made that comment, I am an expatriate and I support what he says. That way during the carnival season when all the locals or should I say the majority go off on vacation to the u.s. Let's see who will patronize the festival activities. He is a brilliant minister, put the policy in place.